I don't know about you, but I absolutely love burgers. They always tempt me when I go out, and I'm a sucker for a whopper from Hungry Jacks. Even though I get really sick later, I still do it. I started my hunt to create a beef patty that tasted just like the ones I get when I eat out. I've always grown up the Aussie way with rissoles or beef patties on the BBQ, but it always had the chunks of onion and a different flavour to the patties I would enjoy out. 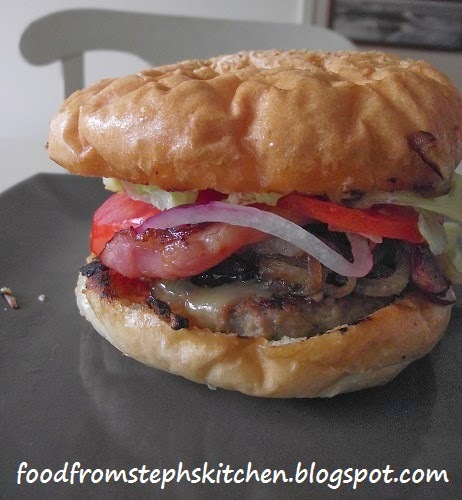 I first started simply grabbing store bought patties from the deli when I felt like a burger. I knew these were pretty close to the sort of patties on your usually take-out grill. Looking at how they were made and how they cooked I worked out that the reason why mine always taste different is all the binding ingredients I need to use, and the consistency is different because of the onion I add for flavour. So I threw the onion and all my herbs in and blended it until the onion was finely chopped, then I added it to my mince. Doing this still didn't give me the exact flavour I wanted because I still had to add my breadcrumbs and egg to bind it all together. I then had a light-bulb moment. Why not simply use the fat in the mince to bind everything together? So the next time I added mince into the food-processor with the blended herbs, followed by just a little bit of the usually binding ingredients I use. And it worked out exactly how I wanted. A smooth mince patty but with all the flavour I wanted from my traditional rissoles I make. If you don't have a food processor, don't worry I have an option for you below also. Makes 6 medium sized patties, large enough for your average hamburger roll. 500g lean mince. You could use regular mince, but I don't like too much oil cooking out of them as I find them a little greasy. If you don't have a food processor see my note below. Grab your food processor and throw in your onion and parsley. 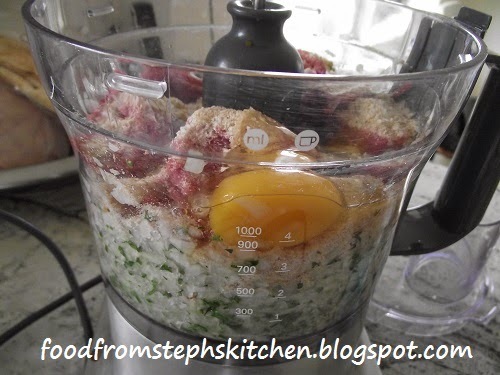 Blend them together until the onion is finely diced. Next throw in your mince, breadcrumbs and crack in the egg - no need to whisk. To make sure you don't over-work the mince, which will make it grainy in texture once cooked, break up your mince into large chunks so that it is spread out around the processor and not just in one section. Now turn it onto the low setting and blend quickly until everything is combined - around 1 minute. Any longer then that and your mince will be grainy, and you don't want that. Trust me. If the onion hasn't blended into the mince very well simply grab it out and finish combining it together with your hands in a small bowl. Divide the mince into six equal amounts, then roll each of them a ball and then flatten them to around 1 1/2 cms thick. I usually flatten each and then lay them on a plate or cutting board ready to go. In a large frying pan or electric pan, heat up a couple of tablespoons of oil (I use rice oil, but you can use olive or vegetable oil also) on a medium heat until you can feel the heat radiating from the pan when you move your hand over the top. Once your oil is ready pop in as many of the patties as possible while still having space between them so that you can easily flip them. Now, I don't time each side like I probably should because I'm always doing something else while things cook rather than waiting and looking at a clock. I'm pretty sure many of you are also like that. What I look for is when you can see the patty is slightly cooked around the very edge of the patty, then flip. If you flip and they aren't brown enough on that side simply leave it and then flip it again once the other side is cooked to get that little bit of extra colour. To work out if they are done I usually use my egg flip and press down on the patty. You want clear juice coming out. If you are still a little unsure, you want the patty to feel more firm then soft when you touch it. Now your patties are ready to add it to your burger bun of choice with all the salads or extras you desire. Fry up some onion with a little butter and oil. Cook them until they are soft and start to have a golden colour. 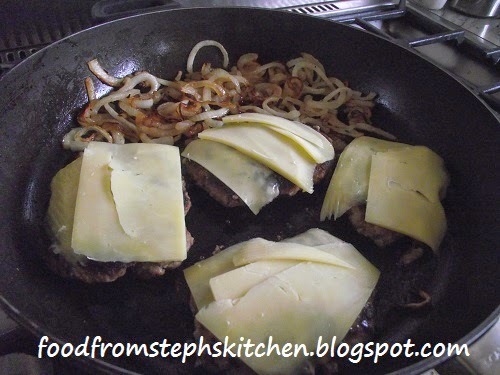 When you flip the burger the first time, allow the other side to get a little bit of colour and then add some cheese slices (and your onion if you are doing it) so that the cheese melts while the patty is cooking. Toast up your burger buns before serving by spreading a generous amount of butter on the open side and frying them off until they have a little bit of colour. Cut the sides of a large red capsicum or pepper and then grill them in a pan or on the BBQ with a little bit of oil. Red peppers are sweeter than green, so it will turn a little sweet when grilled. Make sure you grill it until it has blackened in areas. 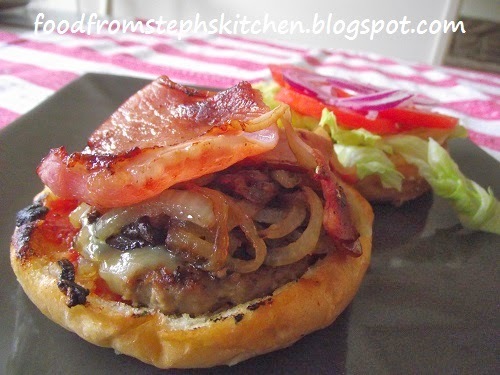 If you are going for a mock-up of a Hungry Jacks or Burger King burger: add cheese to the top of your patty, zap it in the microwave for 25 seconds, add it to your burger bun followed by a little tomato sauce or ketchup, tomato, onion slices (use white or brown onion), and shredded lettuce. Top it off with whole egg mayo on the top side of your bun, and you're done. Zap it again for 20 seconds so that your bun is slightly warm. Note: What to do without a food processor. Grate your onion and finely dice your parsley. Then mix that through the mince, massaging it into the mince so that the fat in the mince starts to bind things. Then add the breadcrumbs followed by the lightly whisked egg, using your hands to mix everything together until smooth. Divide, roll and flatten as per recipe above. Cook as normal. Sometimes it takes multiple tries to get the dish to come out exactly how we want it to but when it does, it's such an accomplishment. Looks like a great burger, I'll have to try it your way.